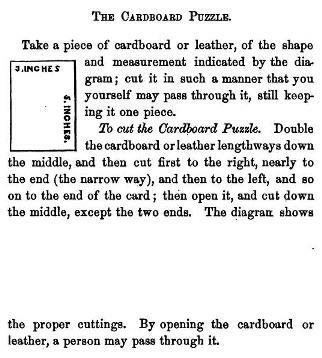 This page attempts to record what is known about the origin and history of the 'How to Climb Through a Playing Card' Fold and Cut Effect. Please contact me if you know any of this information is incorrect or if you have any other information that should be added. Thank you. 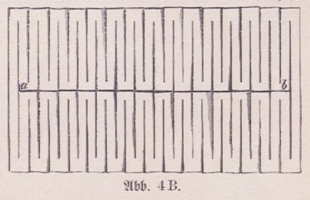 As far as I know the effect first appears under the title 'The Cardboard Puzzle' in 'The Boy's Own Toymaker' by Ebenezer Landells was published in 1859 by Shephard, Clark and Brown in Boston and Griffin and Farran in London. .... and in 'Pleasant Work for Busy Fingers' by Maggie Browne, which is an English version of 'Des Kindes Erste Beschaftigungsbuch', and was published by Cassell and Company in London in 1896.